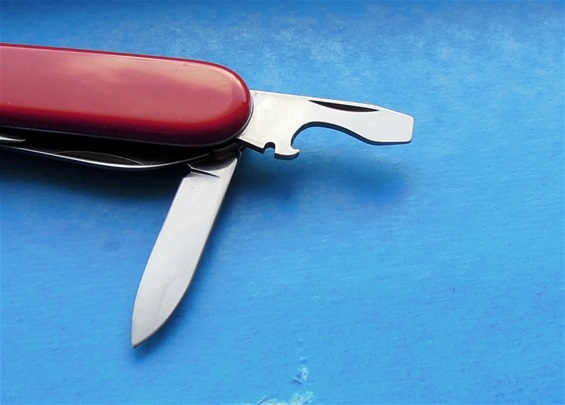 Today i will show you my most special Economy made Elinox Victorinox knife. The number on the box is 3.3600. It is in new condition. This knife alone got the special stamp that i have put in at 1975 and the complete knife is probably made in 1976. There are some details on this knife that i would believe represents the border to the new change and stamp on the economy made knives. From 1976 we get the new tang stamp with the new backside economy on it. This knife does not have the different plastic material that i call signal color. This got the scales that are usually found. What is most special is the corkscrew with the thin fragile constrution. 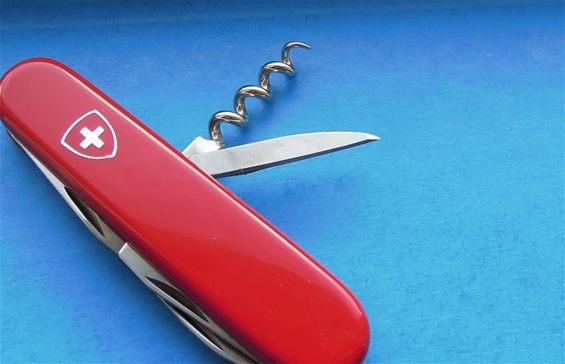 The slim/thin corkscrew was used by Victorinox in the mid-1970s. The tang stamp got the elinox type you find on 1973-1975 on the main side. The special is that this does have a backside stamp as well and not the usual blank. I have put this stamp in at 1975. There is a small variation on the hot stamp emblem on this knife to the left compared to a backside economy stamped knife to the right. 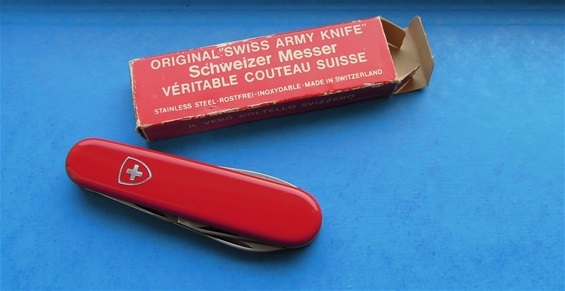 Information from Victorinox says that the hot stamp type emblem was used from 1979 but i have found knives and seen knives with hot stamp emblem in the mid 1970s. 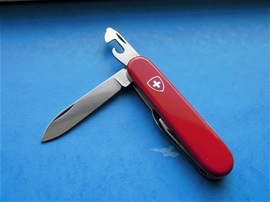 I do believe Victorinox are correct because i believe what they mean is a variation that is very similar. This cross and shield type was used in the mid-1970s but there are variations. On the knife i have shown today there are very small differences and if it had not been for the corkscrew then i would have sad this knife was 1979 but i do not believe so. I put this knife in at the mid-1970s until 1976. With the introduction of the 1976-1980 tang stamp we see knives with a more sturdy corkscrew and we usually see the variation of the hot stamp and we see handle scales with better precision and a new color that would suggest a new plastic material. There are variations all the way. There are many 1976-1980 knives with the hot stamp type emblem. The numbering system is also different on the economy made knives.